AW Edwards has been 100% family owned and operated since it was founded by Austin William Edwards in 1921. His grandson, Bruce Edwards, is now the Managing Director of the company and works alongside his twin brother Malcolm. Their sons have also found their way into the construction industry and have followed their forefathers into the family business. With AW Edwards, the family has had a huge impact on Sydney’s landscape. The company is responsible for some of the city’s landmark buildings. AW Edwards built Newtown’s popular Marlborough Hotel, affectionately known by locals as ‘the Marly’, in the 1940s. In the following decades, much of the University of Sydney campus was completed by the company, including St Johns College. In the 1980s, AW Edwards refurbished Sydney’s Central Railway Station. And anyone who lives in or has visited Sydney will be familiar with the iconic Queen Victoria Building. AW Edwards oversaw the restoration and refurbishment of the QVB from 1983 to 1986. “We have a philosophy that the type of projects and the clients that we work for are more important than simply turnover or end turnover growth. Consequently, we are very selective about who we work for and we are selective about the type of projects we do,” Bruce says. AW Edwards has also played a role in the education and health of the state of NSW. 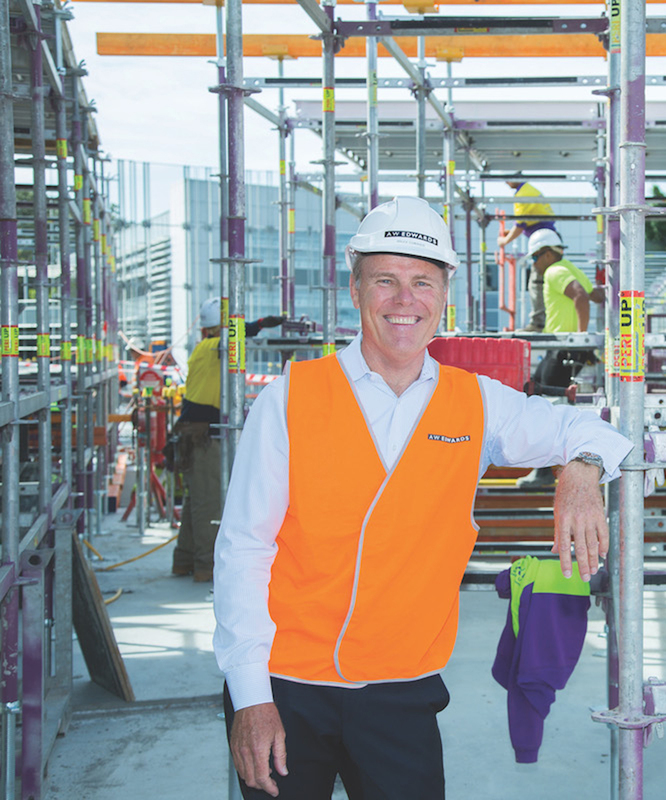 It has been and is still involved in the construction of several University campuses, undertaking building work at the University of New South Wales, Western Sydney University and Macquarie University. And the company has been trusted with building the structures for a number of NSW’s hospitals and medical research centres, starting with St Vincent’s Private Hospital in Darlinghurst in the 1930s. Current projects for the business include the redevelopment of Westmead and Armidale Hospitals, the refurbishment of the Kempsey District Hospital and the construction of the Calvary Bruce Private Hospital in the ACT. The company also continues to work on the state’s railway system. It was responsible for the construction of stations along the new Epping-Chatswood line, and is now working on the Sydney Trains Rail Operation Centre in Alexandria. The longevity of the staff at AW Edwards goes a long way towards its ability to provide competent, quality construction to NSW. Of the 245 employees at AW Edwards, 35 have been with the company for 25 years or more, and 4 have been with the business for 40 plus years. In the 95 years of operation, 117 people have served in excess of 25 years with the company, and 32 in excess of 40 years. Bruce says that is rare in the construction industry, and that many other companies have a high staff turnover.